You know this feeling: You are new in a city, spent the hole day sightseeing and with other touristy things, then you head back to your hotel/hostel/shelter, have a shower - and then? Where to go for dinner? A walk in the evening? A drink in a bar where locals hang out and not only other tourists? It′s for situations like this one that I started TourMyCountry.com for. In this article I will briefly introduce you to those three areas of Vienna that I regard as the coolest for a stroll, relaxed coffee or other drink, or for enjoying a good meal in a neighbourhood with genuine atmosphere. Keep in mind that I don′t like Vienna - so recommending these areas means quite something. All three neighbourhoods are within walking distance from the first district - although they are also well connected with public transportation due to their central location. A quick reminder on the arrangement of Vienna′s districts: First for the historic city centre, the sixth or Mariahilf is north of the Naschmarkt and the seventh is north of the Mariahilferstraße Road. In the 19th century, the University of Vienna was moved into the current building by the Ringstraße - for details on that, read the article on Vienna University. The site it had occupied before was around the area of the Jesuite Church and the Alte Aula or Congregation Hall. Both buildings are covered in a separate article. The neighbourhood around these buildings consist mostly of Medieval buildings, many of which were re-furbished in Baroque style. The narrow lanes and alleys host a wide array of bars, restaurants and shops. Most importantly, there is the Café Alt Wien and the traditional "Gasthaus" style restaurants, but also fancy wine bars where you can familiarise yourself with Austrian wines. 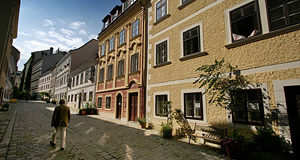 The Schönlaterngasse will take you straight to the Heiligenkreuzerhof Court, which belongs to the monastery of Heiligenkreuz and is said to be the oldest apartment block of Vienna. Nearby you can dine in the "Griechenbeisl", the oldest restaurant of Vienna (very expensive, though). The "Kleines Café" by the Franziskanerkirche marks a northern outpost of this neighbourhood. The Medieval lanes give you a good idea of what Vienna must have looked like before the Baroque boom of the 18th century - although you will bump into the odd Baroque Palais. One of the most important ones is the former Palais of Prince Eugene, which featured in "The Third Man" and is now home to Austria′s Ministry of Finance. It is famous not only because it was built for the legendary Prince Eugene of Savoy, but also for its splendid staircase, designed by Fischer von Erlach. Continue with "Vienna's Coolest Neighbourhoods - Part II"